Wisconsin Governor Scott Walker’s victory in Tuesday’s recall election isn’t a happy outcome for the activists who have spent nearly a year and a half going after him. It’s particularly troubling for labor organizers, who will face subsequent challenges with substantially less resources. The story tells us a lot about the temptations and dangers of the electoral route for social movement activists. As is often the case, organizers pursuing institutional politics wound up with much less than what they imagined possible. Governor Walker was extraordinarily unpopular and his opponents in Wisconsin were intensely committed. But after the senators returned and the governor’s agenda moved through the political process, activists had to figure out what to do next. Wisconsin politics offered some alternatives, none of them easy. What seemed most attractive–because it might work and reverse the conservative tide, was the recall route. Walker’s opponents knew they had to wait to go after the governor (who had yet to serve a year in office), but targeted all of the state senators legally vulnerable to recall. Wisconsin Republicans staged their own recall campaigns against the Democratic senators who had left the state. All of the challenged Democrats survived the 2011 recall, and Democrats defeated 2 of the 4 Republican state senators they challenged. Ah, but they needed one more to gain control of the state senate. Although this was a substantial flexing of left and labor muscle, it was also very costly. It wasn’t just the money, but also the focus and the effort, all channeled into an uphill struggle firmly rooted in electoral politics. They prepared to recall Governor Walker as soon as they were legally allowed to do so. In mid-January of this year, organizers delivered more than one million signatures on petitions to recall Governor Walker. One million signatures in Wisconsin is a truly impressive total, about twice what they needed to make the recall happen, and about as many signatures as votes against Scott Walker in 2010. Wisconsin’s recall law requires not a mandate on the incumbent, but a choice–much like a regular election. Democrats nominated Tom Barrett, the Milwaukee mayor whom Governor Walker had defeated in 2010. The electoral process requires compromises and unpleasant choices. Mayor Barrett was unpopular with organized labor, and had used the new, uh, flexibility, in dealing with organized labor to balance Milwaukee’s budget. The University of Wisconsin Teaching Assistants union, which had been energetic in organizing the demonstrations in Madison, refused to endorse Barrett–or even his primary opponent, Kathleen Falk, because neither would make a strong enough commitment to undo Wisconsin’s new anti-union strictures. And after getting the nomination, Barrett chose not to emphasize the labor issues altogether. Surely he figured that the unions were angry enough about Governor Walker’s administration to vote against him anyway, and that it made more sense to focus on Wisconsin voters who were less stalwart in their support for labor. This is the normal hedging that characterizes general elections in America. The anti-Walker campaigns were largely responsible for drawing national attention to organized Republican efforts to defund organized labor, and the recall election drew national attention–and money. Partly because of the rules, and partly because of the resources, Governor Walker raised and spent much (much much) more money than the anti-Walker forces. Walker was able to start raising money earlier, and spent nearly $30 million, more than seven times what the Barrett forces were able to raise. Familiar conservative funders, including the Koch brothers, Sheldon Adelson, FreedomWorks, Americans for Prosperity, and the Tea Party Express, spent a lot of money on keeping Walker in office. Unions spent money too, but they were trounced. Essentially, the Walker opponents chose to play in an arena where they were at a disadvantage. Still, it might have been the best choice they had. Both sides worked hard at mobilizing support, and Tom Barrett won more than 100,000 votes than he had in 2010, but Scott Walker got more than 200,000 additional votes, widening his electoral margin. Although the recall effort claimed one additional Republican state senator, the legislature may not meet until after the Fall elections. And the people in power get to make at least some of the rules for the next election. Redistricted legislative districts are likely to disadvantage Democrats. 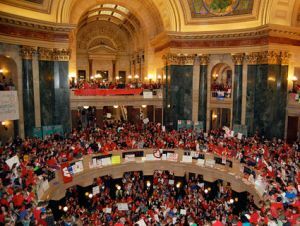 More than that, organized labor has suffered severe losses in the wake of Wisconsin’s new laws on collective bargaining. One element of the reform banned the automatic collection of union dues. The Wall Street Journal reported that AFSCME and the NEA lost fully one-half to two-thirds of their members, who were no longer compelled to contribute to their unions. Minimally, this means even less labor money as a counterbalance to corporate contributions in the next election. The rules of mainstream politics structure the decisions that activists make. Recall, just doing away with the Walker regime, seemed the most comprehensive and attractive alternative for Wisconsinites, but it was filled with risk. The campaign provided a thinner message than the protests in the streets of Madison and the results represented a dramatic defeat. The intense commitment of a minority, even a large minority, isn’t enough to win in a general election. The pressing question now is to figure out what to do next. This entry was posted in Uncategorized and tagged Americans for Prosperity, campaign contributions, elections, FreedomWorks, Koch Brothers, labor, Madison, recall, Scott Walker, tea party, Tea Party Express, Tom Barrett, Wisconsin. Bookmark the permalink. You can’t always get your way! A question such as this, framed within the debate started by Professor Meyer, has a multitude of answers that becomes even more fractured, as different angles of discussion and debate are applied. But despite this intellectual fog that obscures any one real answer to this question, there is a common thread of reason, logic and argument that would weave itself through all possible answers. This particular thread when properly applied, allows the investigator (in this case the person asking the question), the opportunity to see that despite all possibilities – the desired answer fails to produce the desired result. And this question may actually be answerable. Is history an obstacle? Perhaps an uninformed and obtuse electorate is the impediment? Is it inherent structural imbalances found in electoral maps? Or what about uneven ideological population distributions within communities is the underlying cause of failure? Inequalities of wealth distorting the desired outcome? Maybe overall population apathy towards some ideas and policies is the answer to the question of, why? FWIW, the Wisconsin Farmer’s Union (the coop farmers) and Family Farm Defenders rellay do support farmers and they have joined us on the square. WFU runs Kamp Kenwood a summer camp that teaches the cooperative economic model. They even have a disciplinary system that is non-hierarchal peer review (the campers police themselves by committee).